Kim Hyun Joong, " Starcraft 2 on 2 with fans" different type of fan service. SS501 Kim HyunJoong attracted attention with his different type of fan service. Kim HyunJoong left a message in SS501 official homepage on 6-Dec if there are anyone who play ‘Star Craft’ and asked them to go to channel ‘ss501’ in ‘Asia’ region. Fans connected to the game like he said, he formed a team with his fan and compete 2 on 2 in starcraft. Kim HyunJoong chose Zerg race and compete with his fans, and after winning, fans requested for him to play one more game, but he replied saying he has a schedule to attend to. SS501 has officially ended their activities in Korea and is speeding up on their activities around Asia region. For those of you people who haven't heard of Starcraft, it's an immensely popular science-fiction real time strategy video game developed by Bilzzard Entertainment. 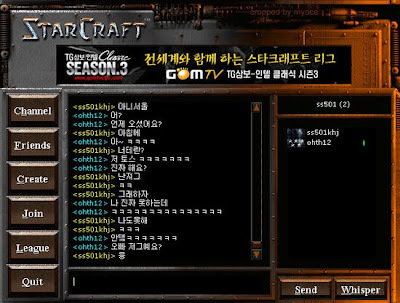 Players can choose to either play the single player version, which is a very extensive and well-written story mode, or the multi-player version, where the player can interact with and duke it out against other players by choosing one of three races (Zerg, Protoss or Terran) to play as on Battle.net's Starcraft server. 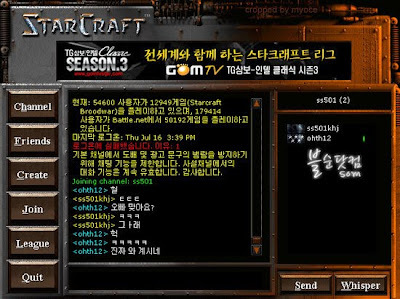 A fan had previously written, "Oppa, please play Starcraft with us," on SS501's homepage. The chances of celebrities responding back to fans, especially to a request like this one, are very slim - so imagine the shock of that fan when Kim Hyun Joong responded on December 6th (around 3PM), saying, "Is there anyone who knows how to play Starcraft?" He explained briefly that his own account for their blog had been hacked so he would be borrowing fellow SS501 member Kim Kyu Jong's ID . Hyun Joong then proceeded to inform his fans that he had created a channel called 'ss501' and created a room with a 2 vs 2 map. Hyun Joong chose to play as the Zerg, and when a fan worried about not having much skill and experience in the game, he responded, "I'm not good either, don't worry." Ok, those are the news about Leader playing online game with fans ^^, So I went around to find a good...and rather big ...screen caps of the battle...found one in naver.com, but I had to crop it several times to make it look bigger....you could see there was Leader [ss501khj] with one fan at first...then they were joined by two more fans. I read that Leader actually won the game, but when asked to play again he said he had to stop cos he he had schedule. Wasn't it sooo nice of Hyun Joong to do that ?? Course many fans are now really jealous he he...click the pix if you want to see a bigger view.